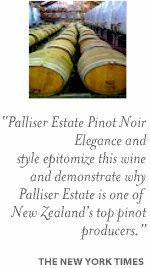 Palliser Estate make some of the finest and most consistent New Zealand Pinot Noir, a perennial winner and always a favourite, representing peerless quality every year. The label depicts a conspicuous lighthouse at Pencarrow Heads, situated to the east of Palliser Bay at the entrance to Wellington harbour. Martinborough is well known for making the New Zealand's most elegant and compelling Pinot wines, Palliser's fruit is acknowledged by many of her local peers to be Martinborough's finest. Pencarrow is the second label from Palliser Estate, gaining recognition for their impressive quality of fruit, distinctive expression of Martinborough and affable approachability. Pencarrow is crafted to traditional Burgundian techniques, harvests of several clone Pinot Noir, including 114 and 115, 667 and 777, Abel and 10/5, a portion as whole bunches, are treated to a cold soak before a wild indigenous yeast vinification for a fortnight on skins. A post ferment maceration for optimal extraction encourages the complex tannin structure and infuses further complexity. The finished wine is pressed into a selection of French oak barrels for a year's maturation. Dark, deep, black hues. Tightly wound, intense and penetrating nose of ripe black fruits with dark herb and spice notes as well as violet florals. Medium full bodied, the flavours unfold and reveal black fruits and floral, concentrated and densely packed, supported by fine grained yet firm tannins. The oaking is sensitive and the youthful acidity carries the flavours to a long, lingering finish featuring spicy black fruits with hints of liquorice.